MOSH seeking funds to expand, renovate to support capacity, demand - The Resident Community News Group, Inc. | The Resident Community News Group, Inc. While many balls are up in the air in Downtown Jacksonville, one nonprofit on the Southbank has been quietly making plans over the past six years for a major expansion. 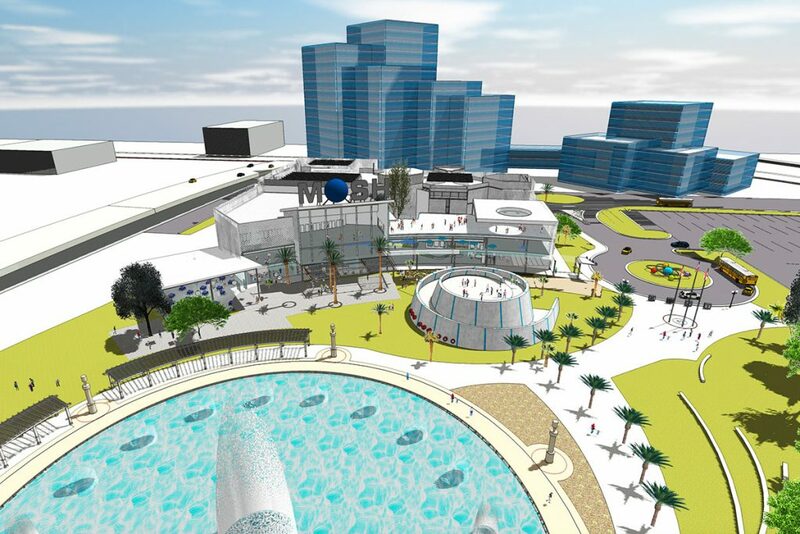 On March 18, the Museum of Science and History (MOSH) unveiled an $80-90 million vision that would double the size of the iconic attraction without changing too much of its current 15-acre footprint next to Friendship Fountain. Seeming to avoid the political and civic angst over proposed changes to the Northbank – including demolition of the old courthouse, proposed demolition of the Hart Bridge ramp and The Landing, and lack of concrete plans for The Shipyards and Metro Park – leadership at MOSH has already gotten a buy-in from over 250 stakeholders for its master plan for growth. Located at 1025 Museum Circle, near Friendship Fountain and St. Johns River Park, MOSH hopes to incorporate that area organically into its expansion plan, which includes expanding its square footage from 77,000 square feet to 120,000; turning the museum’s “front door” to the river, and adding an outdoor café, a rooftop meeting and event space, and innovation labs. Existing space will increase 200 percent as will the museum’s revenue-generating area. In 2023, MOSH anticipates earning revenues of $6 million. The 78-year-old museum, which has its roots in the Jacksonville Children’s Museum in Riverside, moved into the Southbank facility in the late 1960s. Funding for the project is planned to come from individuals, businesses, corporations, foundations, with approximately 75 percent from public funding, which includes local, state and federal sources. The museum is also selling naming rights to the project, which is anticipated to take about five years to complete. Construction of the three-story facility will be done in phases to allow the museum to remain open. In 2017, MOSH served nearly 230,000 people through onsite visits and educational outreach programs. When the expansion is complete, the museum projects it will serve nearly half a million people in 2023.